"A Little Help from Our Advisors, Contributors & Supporters"
Our Advisory Board consists of people we contact on a regular basis to review, critique, and evaluate the content and direction of our website and the promotional materials that we publish and distribute. Contributors are people who have participated by producing a "public presentation" of their related field of expertise in the nuclear industry and/or waste repository science and engineering fields. All of these distinguished people are volunteering their assistance to serve on ourAdvisory Board. Their interests and contributions are growing and are also attracting the attention of other scientists and engineers in the nuclear fields throughout the country. If you have an interest in joining this mission please contact us. AREAS OF SPECIALIZATION (A layman with a mission). I grew up in Maine playing ice hockey about 12 years in the Contractors Hockey League. I played music with several local bands, Bob Bedard, The Fascinations, my band The Liverpool Gas Company played the PAL Hop Days at Lewiston City Hall. We were an opening act for the Young Rascals, Dave Clark Five, Cyrkle, McCoys and others. I lived there about 38 years and moved to Nevada in 1984. I saw the Maine Yankee Nuclear Power plant go online in 1972 and it produced electrical energy through 1997 a 25-year successful operating history and planned retirement. My knowledge of nuclear energy is that of an average citizen, I am not a scientist or an engineer. An entrepreneurial background began at the age of about 7 or 8 talking an employee of a lumber company into building me a rock maple shoe shine box for a percentage of my earnings, he did, I did, I paid, I still have it! I served as Executive Vice President of the Maine Jaycees, organized the first statewide multi-chapter March of Dimes Walk-A-Thon. I started and operated Duarte Typesetting Company for 17 years, the first computerized book phototypesetting company in the State of Maine. We developed a software application Stylo-Type I, the first "Mac" based mnemonic coding program to link a Macintosh computer to a Linotronic typesetting machine. Coauthored a paper "The SGML Solution to System Independence" by Gary J. Duarte, President, DeskTop ComPosition Systems, Inc. & J.Sperling Martin, Vice President, Aspen Systems Corp. 1990. SGML (standard generalized markup language) was a text based mnemonic markup code, a predecessor and included as part of HTML (hypertext markup language) now used in WEB document processing. As an industry specialist I taught the Introduction to Printing & Graphics at Truckee Meadows Community College several years, Reno, Nevada and worked several years in the casino entertainment realm on stage work and as an audio video technician. Most recently, I made a presentation on the need for the industry to support grassroots education on rebranding nuclear technology at the Advanced Reactor Technical Summit III at the Oak Ridge National Laboratory. 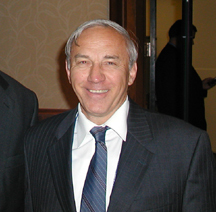 Dr. Alan Waltar: He was the keynote speaker at our USNEF presentation during the American Nuclear Society meeting in Reno, 2006. 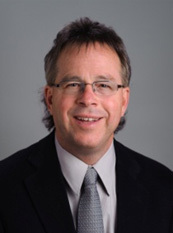 Dr. Waltar is a retired Senior Advisor and Director of Nuclear Energy to the Pacific Northwest National Laboratory (PNNL), Richland, Washington. He was also Professor and Head of Nuclear Engineering at Texas A&M University, where he helped to build that program into the largest Department of Nuclear Engineering in the nation. Dr. Waltar is a Fellow and Past President of the American Nuclear Society. He is also author of the book “Radiation and Modern Life” - Fulfilling Marie Curie’s Dream” and “America the Powerless” as well as co-author of two textbooks on fast reactors. He serves as well as a consultant to the IAEA and the U.S. Department of Energy. Dr. Waltar was instrumental in the formation of the World Nuclear University Summer Institute (SI) and has served as a mentor and a member of the faculty for all eleven of the institutes. Bruce Marlow, Bruce has been supporting the successful operations of the Nuclear Power Industry by driving Innovation and training along with leading large integrated projects. Currently, Bruce is working on Clean Water, Geothermal and Energy Storage projects that are keeping him running on a very busy pace. While at AREVA, Bruce was the Integrated Site Manager leading the AREVA Team working to return the San Onofre Nuclear Generating Station (SONGS) back to service until its unfortunate close decision. Before becoming a Vice President, Mr. Marlow served as the General Manger of Conam/Rockridge, an AREVA legacy company where he was responsible for all Business Development, Project Execution and Technology Advancement. He developed Conam from a $2.5 million company in 1980 into a $40 million organization in 7 years. In 1997, Conam generated 70% of the operating income of AREVA North America. Mr. Marlow has worked at every Pressurizer Water Reactor (PWR) in the US and several in Japan and Europe. Radiological controls in the handling and packaging of spent nuclear fuel and nuclear waste. Analysis of radiological waste and waste residues, In Situ treatment of buried radioactive-TRU and LLW hazardous buried and underground tank waste,- liquids, ashes, salts, sludge's, debris, contaminated soils Development of treatment criteria for both effectiveness and implementability. Preparation, review implementation of technical work documents for handling, treatment and disposal of the full spectrum of radiological materials. AREAS OF SPECIALIZATION: Arvid Pasto spent his entire 39-year career working in the field of materials for energy applications. He retired in 2007 as Director of, High Temperature Materials Laboratory (HTML), and Manager of EERE and Technology Programs, Metals and Ceramics Division at, Oak Ridge National Laboratory (ORNL). In the latter capacity he directed the operations of the HTML, a national “user facility”, and he managed the applied energy technology programs of the Division. Experience includes eleven years at the corporate R&D center of GTE in Waltham, MA, and eight years prior to that in the Metals and Ceramics Division of ORNL. 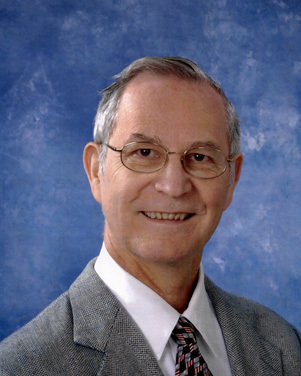 During his time at ORNL he became, in the 1970’s, one of the world’s most knowledgeable individuals on europium oxide, a potential to replace boron carbide as the control rod material for fast nuclear reactors. He conducted in-reactor radiation tests of europium oxide at the EBR-II reactor at the Idaho National Laboratory. Later, he was on the ORNL team that won an IR-100 award for their development of microsphere nuclear fuels. His degrees are from the State University of New York, College of Ceramics at Alfred University, earning a B.S. in Ceramic Science in 1967, an M.S. in Ceramics in 1969, and a Ph.D. in Ceramics in 1972. Arvid is a Fellow of the American Ceramic Society, and has served on numerous professional boards and committees, including the Virginia Tech MSE Department Advisory Board. He was also Vice-President of the United States Advanced Ceramics Association (USACA). Dennis Moltz, PhD: Dennis is Co-Coordinator for our USNEF Northern Nevada Chapter. His background is a B. S. Chemistry, B. S. Mathematics, Texas A&M University Ph.D., Nuclear Chemistry, University of California, Berkeley Dennis owns, High Desert Nuclear Technologies LLC, Carson City, NV Dennis does contract work for Radiation Detector (all energies of photons and particles), Ion source technologies, isotope separations, chemistry of radioisotopes, Nuclear Waste Issues, Low Level Background Counting, Fabrication for Any Nuclear Experiment, Special Nuclear Electronics Designs. Dennis has experience with most accelerators in North America. John Shanahan, President, Go Nuclear, a Civil Engineer. Over 30 years’ experience with design, research and licensing for commercial nuclear power plants in the USA and Switzerland. Advocate for global public education about widely useful forms of nuclear power, science, technology, medicine, and low-dose radiation. Go Nuclear, Inc. is a non-profit organization based in Denver, Colorado, USA. We work with professionals in nuclear energy, nuclear medicine, and low-dose radiation around the world. We also work with advocates outside these fields from students up to retired professionals in other fields. John is also President of Environmentalists for Nuclear Energy - USA, EFN-USA, is a non-profit organization based in Denver, CO. It affiliated with and align our values and mission with Environmentalists for Nuclear Energy, EFN, in Houilles, France, Bruno Comby is Founder and President. Dr. Johnson’s area is high frequency electronics and electromagnetic compatibility. He is trained as a Physicist including courses in nuclear and health physics. Current research interests include solar and piezoelectric energy generation and high frequency instrumentation. Businessman who has profited well in Financial management, Equipment leasing, Building material and Lumber sales. As a youth in the San Francisco area I was promised a "glowing" future with the advent of cheap electricity, using nuclear energy. Unfortunately, Luddites and emotional environmentalists' protesting the future, have brought this nation to the brink of perpetual darkness and financial ruin by refusing to use this safe, clean production method. Knowledge is power and the truth regarding nuclear power production is the key to all mankind, living in comfort and developing the potential for eliminating poverty throughout the world. Fearing the unknown and making no effort to know, will doom you to fear alone. Supervising student 4th year Capstone Course Projects at University of Toronto (2011- present) Project Manager for Engineering Strategies and Practice course at University of Toronto (2011 – present) Teaching aerodynamics, math and engineering and nuclear engineering at Georgian College (2008 – 2012) On Georgian College Advisory Committee for implementation of a Power Engineering Program and set up a nuclear engineering course (2008-2010) 31 years at OPG – Nuclear (retired in 2007) Positions included, engineering, maintenance and operations / Major Components Lifecycle, SG’s, HX, Pumps, Piping / Tooling design for life extension and refurbishment / Contracts Manager and Shift Outage Manager / 20 years in electric vehicles, teaching, design & consulting (1990-2010) / Published papers for SAE and NESEA / Taught EV Technology Course at Durham College / Organising Electrothons. 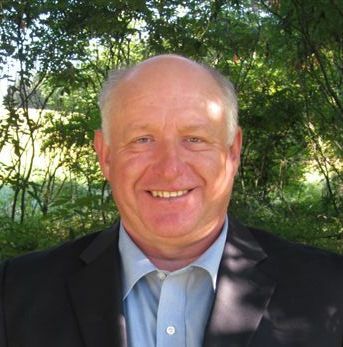 Mr. Letourneau has 30 years experience in both public and private environmental management and nuclear issues. 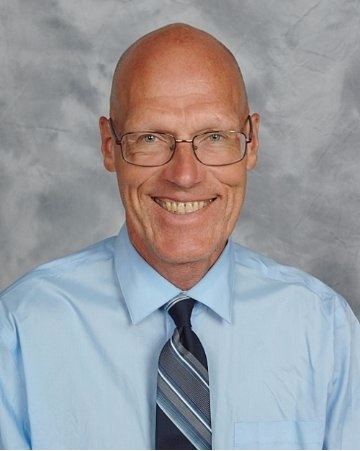 Mr. Letourneau has a Master’s Degree in energy and environmental public policy from the Kennedy School of Government at Harvard University. During his career, Mr. Letourneau has been an environmental consultant, Vice President of Jason Associates, which wrote the environmental impact statement for Yucca Mountain, a member of the NCRP waste board, and consultant to the IAEA on shallow land burial of LLW. While with the Department of Energy, Mr. Letourneau was project manager for the development and implementation of DOE’s radioactive waste management directive (DOE Order 435.1); involved in the preparation of determinations allowing the Department to dispose of residual HLW at the Idaho National Laboratory, West Valley Site, Savannah River Site, and Hanford Site; and was instrumental in developing, deploying, and leading the public and stakeholder involvement process used to reach consensus in the tank closure projects. Consulting Physicist: Instructor for nuclear engineers and physicists re. in-core reactor radiation detection principles and system design for China Nuclear Power Research Institute, Shenzhen, China (2012-2013). Quarterly Reactor Physics School instructor for post-grads regarding reactor radiation detection systems at Atomic Energy of Canada Ltd.’s Chalk River Laboratories (2011 - present). Contract Physicist for Mitsubishi Heavy Industries, US-APWR projects (2010 - 2013). Contract Physicist & Radiation Safety Officer for Mirion Technologies (IST Canada) Inc. (2010 - present). Extensive experience measuring and monitoring radiation. Specializing in research, design and development of radiation detectors, radiation monitoring, and Class 1E reactor control systems for a variety of applications; also preparation and presentation of radiation monitoring and radiation training programs and instruction. I appreciated the role of nuclear energy growing up in the Chicago area where Commonwealth Edison achieved over 50% of its generation from reactors by the 1970's. Graduated from Indiana University in 1976 with degree in Transportation & Public Utilities Management. Experience in private sector ranged from work in an industrial traffic department to North American agency operations for global cargo carriers. My twin vocational aptitudes of Analysis and Accounting are now employed with CyberTran, developing an automated Ultra-Light Rail Transit (ULRT) system. Civic involvement includes 12 years on advisory committee to Alameda County CA Transportation Authority and now membership of Pahrump, Nevada's Nuclear Waste & Environment Advisory Committee. 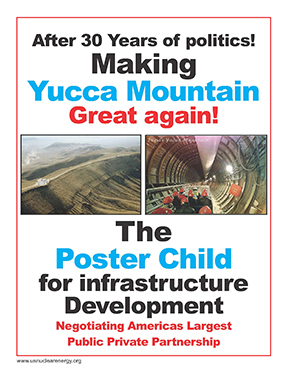 I jumped into the fray over Yucca Mountain when a National Monument was designated as an underhanded ploy to block rail access into the repository.